Don't you just love pretty things? 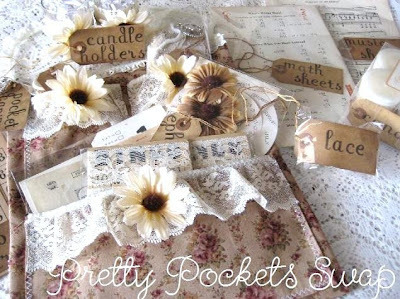 I have been drolling over some of the pretty pockets out here in blogladn and flickr that Jessica just posted. I decided to join Jessica's Pretty Pocket Swap and can't wait to share some peaks of what I have been working on for my swap partner Sarah of Gypsy Mermaid. This is such fun...to blog hop and see all the swaps going on....so pretty, and inspiring to boot! I am drooling too! Hurry get me a tissue! Hi....these are just adorable. You have done a lovely job!